Posted in Lamb, on July 12th, 2007. Ah, Shepherd’s Pie. A favorite of mine. But not something that particularly comes to mind when the temperature is in the 80’s, does it? I made a batch of this last winter and one lone casserole was still languishing in the freezer awaiting a night when I can’t cook. I’ve been diagnosed with a broken toe (1) and a very severe ankle sprain, and have been advised to use R.I.C.E. : R(est), I(ce), C(ompression), and E(levation). So, frozen Shepherd’s Pie was a godsend last night. So, just what is Shepherd’s Pie? 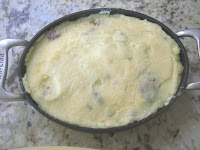 Traditionally it’s a ground or minced lamb dish with some vegetables, always some peas, a bit of gravy or sauce, topped with mashed potatoes and baked until hot. Its lineage is British. Cottage pie means it’s made with ground beef. Here’s a bit of history from HGTV (yes, really):The magic of pies dates back to King Henry VIII. Legend has it that the British ruler was livid when he found out that one of his abbots was building an elaborate and expensive kitchen. The wise abbot took the wind out of the King’s anger by sending him a delicious, warm pie. Early pies were predominantly made with meat. Two early examples were shepherd’s pie and cottage pie. Shepherd’s pie was made with lamb and vegetables, and the cottage pie was made with beef and vegetable. Both are topped with potatoes. I had Shepherd’s Pie when I visited England for the first time in 1977. Fell in love with it at first bite. It’s comfort food, to be sure. Kind of a casserole, if you will, but delicious. Great made with leftovers; in fact, I think that may be part of its origin too, since our Shepherd’s Pie doesn’t include a crust, just the thick layer of mashed potatoes. You have a leftover lamb roast and mashed potatoes? What better use of it than to make a leftovers Shepherd’s Pie. So, some years back I read a recipe in Cooking Light for a jazzed-up version of the dish, and tried it. It added zucchini among other things and contained quite a few vegetables; probably more than the original version would have. It may have used ground chicken, but over the years I’ve reverted back to the lamb. But what’s unique about this is the addition of chipotle pepper AND the use of sweet potato and regular potatoes mixed together. I always – always – make a large batch of this because it’s a great dish to freeze. If you’re not so sure you’ll like it, just make a half a recipe and you’ll have sufficient for several people. If you like Shepherd’s Pie, then you’ll undoubtedly love this dish. If you’re not crazy about hot, spicy food, leave out the chipotle. It’ll be fine that way, just not quite as zippy. The sweet potatoes and Maui onion add a sweetness to the overall dish and some people are turned off by meat tasting sweet. If that’s your M.O., just use white potatoes and regular onions and you’ll have a traditional pie with a zip. I’ve served this to guests on more than one occasion, to great raves. NOTES: Shepherd’s Pie has been a favorite of mine since my first trip to Britain in 1977, so anytime I find a new version of it I’m glad to try it. Historically, in Britain, the Pie is made with lamb, but it can be made with ground beef as well. If you use the very leanest beef, it won’t have a whole lot of flavor, unfortunately. I usually increase the amount of vegetables called for in this. If you use the Maui onions, you’ll notice a sweetness to the meat and vegetable section, so you may prefer to use traditional yellow or white onions instead. The original recipe called for just sweet potatoes on top, but I thought that might be a bit too sweet, so mixed them, using about half of each. That, combined with the chipotle chile, gives the potatoes a very rich color. 1. Bring a large pot of water to a boil and add chunks of the potatoes and yam; reduce heat and simmer until yam is done and remove those pieces. Continue boiling the potatoes until they are tender, then drain and set aside to cool slightly. 2. While the potatoes are simmering, in a large frying pan heat a little olive oil and add the onion, celery and carrot and sauté for about 7-10 minutes. Cut up the zucchini, mushrooms and garlic and add to the pan, and cook for another 5-10 minutes until zucchini is barely done. Add the parsley, tomatoes, tomato paste, season with salt and pepper and cook for just a few minutes. Remove the vegetables to a bowl and set aside. Drain the frying pan and add the ground lamb and sauté it until it is thoroughly cooked. Drain the meat onto a paper towel if any grease needs to be blotted. Clean out the pan a little bit with paper towels, then add back the lamb and Worcestershire sauce. Bring to a simmer, then add all of the vegetables and heat through. 3. Combine the yam and potatoes and using a mixer, whip them until there are no visible lumps. Add the milk, chipotle chiles and ricotta cheese and mix until just combined. Season with salt and pepper to taste. Spoon the lamb mixture equally into 3 casserole dishes. Spoon the potato mixture on top and using a spatula or flat spoon, push into the corners and more or less “seal” the potatoes to the sides of the casserole dish. This last step really isn’t required, but it keeps the meat and vegetable portion from drying out. You may, if you want, add some grated Cheddar cheese to the top of the potatoes, but it’s not really necessary. 4. If baking immediately, bake for 30 minutes at 400°. If you refrigerate the dish first, it will take nearly an hour to heat it through. Sprinkle the top with additional parsley when serving it. If heating leftovers, it doesn’t take all that long to heat – about 2 minutes in the microwave for a serving. Serving Ideas : This casserole is easy for freezing ahead. Sometimes potatoes get a bit soft and runny when they’ve been frozen, but once they’ve been heated again they’ll be just fine. If you are freezing one or more of these casseroles, put a piece of plastic wrap directly onto the potatoes and push it in so it’s touching everywhere, even in the corners. This will prevent freezer burn from sitting on the potatoes. Per Serving 321 Calories; 17g Fat (46.6% calories from fat); 16g Protein; 27g Carbohydrate; 4g Dietary Fiber; 53mg Cholesterol; 275mg Sodium.